In a highly cordial audience this morning in the Vatican, Benedict XVI repays the US president for the warm welcome he received in his recent US trip. In an unusual break with the traditional protocol the two leaders met in the Tower of St John and strolled through the Vatican Gardens. Vatican City (AsiaNews) – Today’s talks between Pope Benedict XVI and the US President George W. Bush focused on the Middle East and the peace process in the Holy Land, globalisation, the food crisis and international trade, the achievement of the Millennium Development Goals and relations between the United States and Europe, a press release by the Vatican reported. Bush’s visit to the Vatican, which lasted almost an hour, gave Benedict XVI an opportunity to repay the US leader for the “cordiality of the welcome received by the Supreme Pontiff during his recent visit to the United States of America”. On that occasion President Bush personally welcomed the Holy Father when he landed in the United States on 15 April and, in an unprecedented gesture, hosted the Pontiff at the White House for cake and best wishes for his birthday. “During the cordial talks, the Holy Father firstly reiterated his gratitude for the warm and exceptional welcome he had received in the United States of America and at the White House during his visit there in April, and for the president's commitment in defence of fundamental moral values,” said the Vatican note. 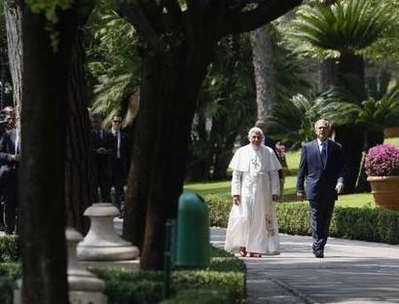 According to Vatican sources, today’s meeting followed a novel, more intimate protocol as requested by Benedict XVI in return for the warm and cordial way he was welcomed in the United States. The Holy Father greeted Mr Bush, who was wearing a blue suit and tie; Ms Bush, in black in accordance with Vatican protocol; and US Ambassador to the Holy See, Ms Mary Ann Glendon, a few minutes before 11 am at the entrance to the Tower of St John located in the Vatican Gardens, rather than in the Pope’s private library in the Apostolic Palace which is customary. “What honour! What honour!” said the president as he got out of the car. Later the tête-à-tête between the two leaders took place in a studio on the upper floor of the tower. At the end of the private meeting, the visit went back to the more intimate atmosphere with a tour of the Tower’s balcony and a 15-minute stroll through the Vatican Gardens, through the Jubilee Bell to the Grotto of Our Lady of Lourdes where the Pontiff provided his a guest with a musical intermezzo by the Choir of the Sistine Chapel, whose members the President greeted afterwards.